Join our presentation “GSM Network in Box”at the MVNOs World Congress on 9 Apr, at 10:00AM and 3:00PM. This demo consists in a full operational private GSM network based on our Core nodes. Bring your own cellphone and try it by yourself!! Leib ICT is the first ICT company based in Uruguay committed to designs that address all the requirements of modern carrier grade systems (fault-tolerant, scalable, robust and flexible) in the shortest time, maintaining the quality of its products at incredible prices. See how can we do it. Our specialty in USSD, SMS (GSM, CDMA, TDMA) and Location Services enables us to bring immediate benefits to operators, developers, system integrators and content providers. An interactive and fast way to customer connection, download contents and money transfers. Location tools define the new value added services. Short Messages integration for UMTS, GSM, CDMA and TDMA networks. 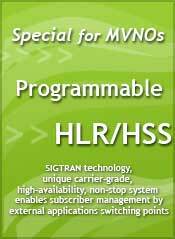 The most used intelligent network protocol accessible by various products and modules. Top performance solutions for the core Network.